The uses of beans in Mexican cooking are immense. Although you can buy them already made, if you make them at home they have a much nicer flavor and you will give your kitchen an irresistible smell. You can make a lot of them and refrigerate a batch which should last in the refrigerator for about 4 to 5 days. You can freeze another batch which will last for months. 1. Don’t add the salt in the beginning or it will toughen the beans. Add it at least after an hour of cooking when the beans are already a bit soft. 2. You don’t need to soak them the night before cooking. Yes, that helps to reduce the cooking time, but it is not necessary. If you do soak them, don’t soak them more than 12 to 14 hours, because they may begin to ferment and you will finish with a Chinese rather than Mexican tasting dish. I like making them with either Black beans, traditional in the South of Mexico, Peruvian beans, which are more used in the Central part of Mexico, or with Pinto beans which are more customary in the North. The latter ones have a creamier feel and more subtle flavor. Traditionally Frijoles de la Olla are cooked in an earthenware pot. It does impart a special Pueblo style flavor. Many cooks in Mexican kitchens make them in pressure cookers, as it cuts the time almost in half, but I am a bit weary of them, as I have seen one too many explode!! Plus, cooking beans only requires you to be home for a certain amount of time, you don’t need to do anything but peek in every once in a while to make sure that there is still enough liquid. I cook mine sometimes in an old earthenware pot and sometimes in a normal large cooking pot. They both work very well. Rinse the beans in cold water and drain. Place them in a big heavy pot and cover with enough water to come up to at least 3″ above the top of beans, about 10 cups of water. Incorporate the onion and bring to a boil. Let the beans simmer, partially covered, for about 1 1/2 hours, until the beans are soft and then add the salt. Don’t add the salt in the beginning or it will toughen the beans. Let them continue simmering, for about another 15 minutes, or until the beans are so soft they come apart if you hold one between your fingers, and the broth has thickened to a soupy consistency. If the beans are not yet soft and the broth is drying out, add more water. Before eating, remove the cooked onion with a slotted spoon. ¡Hola Pati! ¡Me encanta tu show! Oye, un preguntita..lo que pasa es que no tengo una olla grande. Simplemente tengo una pequeña, de esas que son como para hervir agua, quizá como de 2 litros. Aún puedo hacerlos ahí?? Gracias. Un abrazo. Si! Lo puedes hacer ahí, solo ajusta el agua. How to season a new clay Olla? To cure a clay pot you have to wash it with foamy warm water, rinse well, fill it with water and then set it over low heat and leave it there for hours… until all water evaporates. A bit laborious, but worth it, Michael. Have fun with your new olla! I was wondering if you had any suggestions as to how to reduce the “gassy” consequences of eating beans. Try using 1/4 t. Baking Soda while they soak. Hi Pati! I have a bean pot and would love to use it for these, but it can not go on the stove top. Any suggestions for putting it in the oven? I have never made them in the oven… but there’s no reason why you couldn’t try or why it shouldn’t work. Mmm rice and beans is such a yum meal, Gus. I thought there was always pork fat added??? I don’t use lard in my recipe…but you can, Ellaine. It will be delicious too! I cook my beans in a slow cooker over night, I do not put onions, nor do I add salt. They come out soft and delicious. I put half in the freezer and half in the refrigerator to use during the day. What is the botanical name for epazote? I know we have it here in the US. Hola, Pati. I am so glad to read that you favor dispensing with the tired, old habit of soaking beans! I think there’s a trend now to just cook them and forgo soaking because I’ve read this elsewhere. Oh, black beans are so much better just plain cooked! Love you and your boys and your show! Thank you for tuning in Keith! In Patti’s email Bruce had a question regarding cooking beans until they are soft enough to eat. I do agree with Patti and I often do not soak my beans overnight. Some say that soaking the beans allow them to not create gas. Oh I am not for sure if that was the proper way to phrase that. Also when adding make up water or stock to the beans, only add hot liquid. The cooling down and the heat having to rebound can make the beans tough. Also, if you are adding any acid to the beans such as lime juice or vinegar, add that to the beans at the end of cooking after they are soft. Also you should consider your elevation where you are cooking. At sea level water boils at about 220 deg. F. At 220 your soaked beans should take about 2 hours to cook. Lets say you are at 7000 feet above sea level in southern NM. At 7000 water boils at 190 deg. F. So, you can only cook the beans at that temp. At 7000 feet it will take your beans simmering for 4 hours to get cooked. Hope this helps, Steve Gibson, “Camp Cookie”. Thank you for sharing your tips, Steve! That will delicious, Sandra. Enjoy! How would I measure for 1 – 2 people? Should I assume 1 cup of frijoles for each person? Depends on how hungry you are…you can cut the recipe in half to make less but they make for some delicious leftovers! That pot of beans from Facebook is a new recipe I’m testing out…it will be up soon! HI Pati and thank you for opening up my “Mexican Table”! I’m making your beans in my brand new Instant Pot. Do you think I need to be concerned about adding salt at the beginning given that I’m pressure cooking them? I’m playing it safe today, no salt till I “fry” them. Oh and I’m stepping outside the box. I didn’t want to use hydrogenated lard so got some pork suet from my butcher. I can hardly wait to smell & taste the beans! Does the age of the pinto beans matter? My bean broth is not clear it is cloudy and greyish? Thanks for the question Natalie. As the beans cook the broth will start to gain color, that is normal. Please help. My beans keep splitting. I’m not sure, if I’m boiling too much. I usually boil and then simmer. If I want to use two pounds (dry beans), can I simply double all the ingredients and add enough water to cover 3″ above the top of the beans? Or does it not work that way? I made these today! I put a whole shishito pepper in the beans along with the onion and oh my gosh, they were so good. It did take over two hours for them to cook until tender — I did not soak them like you suggested. I will most definitely make these again. Love your cook book Pati. 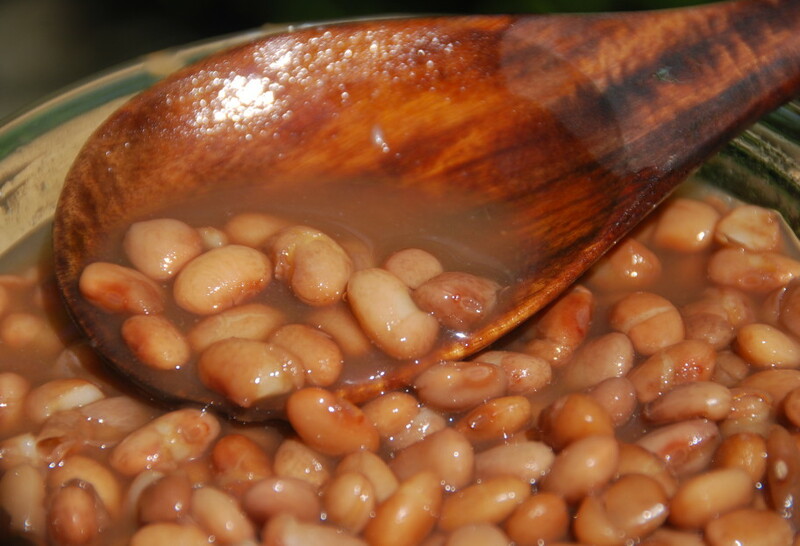 Simple pot of beans is excellent and easy, used them to make your refried beans recipe – awesome! and bean burgers also delicious. Thank you so much for the Pan de Muerto recipe! I love to bake and am really looking forward to giving it a try! I do have a question about your Frijoles de Olla though. When you add it, how much epazote do you use? And do use it dried or fresh? What olla pot would you recommend? Gloria thank you so much for sharing your story! I’m so happy the beans were a good match to your mother’s recipe. I usually make as is with salt, epazote, and onion, but I am of the belief that there are few rules in Mexican cooking… the jalapeno may be a delicious addition! Go for it! Regarding the Jalapeno, our recipe for beans is quite like this one Pati. Once in the serving dish, we offer chopped onion, Jalapenos and diced tomatoes to spoon over the beans. Serve with a slice of Jalapeno, or plain, cornbread. A meal made in heaven. Love your show! Hi pati, i just wanted to thank you, I am a white woman narried to a mexican man and i dont know what i would do without your recipes.. thanks again so much. I love your show especially when you go to San Miguel. We go there often and stay at La Questa me encanta. LA receta para chilaquilles porfavor. Muchas graces. Our family loves this recipe! It is so easy and so delicious! I look forward to trying more of your recipes! i want to purchase an olla..do you use a lid with your beans?? Not sure if my request was submitted or not, so here I go again. I watched your show cooking black beams for Big Brunch Enchiladas and you used an herb comparable to cilantro, but I could not quite understand the name of it. Will you please let me know what the herb is? Of course Elizabeth, it is called Epazote. Available fresh and also dried in Latino or international grocery stores. I just love your show, you inspire me to do more and try new things. I just watched you cook black beans in a clay pot for your Big Brunch Enchiladas and you used an herb that is comparable to cilantro. I could not understand the name of it so please let me know what it is. Thank you for all you do. Looks like your are a proud mama and a busy one. And thank you of your very very lovely message, Elizabeth. I am making this recipe and I really hope I did it right. Your method seems to not require the beans to soak at all, is that right? I hope I am doing this the right way! My husband loves Mexican food more than anything and I really want to impress him with this. Does the 1TBSP of salt add an overpowering salt flavor to the beans? If so I might want to cut back on the salt a bit. Thanks in advance for any answers! No soaking! The 1 tablespoon of salt is just enough, for that 1 pound of beans, for my taste. But if you are not sure, you can start with half and add more as you go. I love your show, and have made many of your recipes and have enjoyed them all. I have a kamado barbecue called the big green egg. I have been making pot beans for years slow cooking them over wood charcoal. I use pinto beans, add lard or bacon fat, onions and water, in a earthenware bean pot. I let this mixture cook for 4 hours at around 225 deg. I then cube up some of my homemade bacon, sautéed with more onion and a Serrano or jalapeño. I also add some chicken broth to boost the beans broth flavor. Usually I let the beans stay on this low slow cooking for around 8 hours. The broth thickens, and the flavors are just amazing. I dont think they are traditional pot beans, but in our home they are a huge staple. Is there a name for beans adding bacon or smoked pork in Mexico? Is that charro beans? Thank you for your inspiring recipes! I bought a new olla for making frijoles. I have always cooked them in an iron pot, but now I want to use the clay pot. Should I prepare it in a special way? I want to use it on my gas stove and also in my outdoor wood-fired oven. Do you have any tips for doing this? Thank you so much for watching my show, Myrleen. I am so glad it brings back memories and recipes! Yes: to use your clay pot all you need to do is wash it well with soapy water, rinse throughly. Fill it to the rim with water and place it over low heat, let the water come to a gentle simmer and evaporate. Once you have very little left, like an inch, let it sit there over night. Rinse and use. However, you can’t use your clay pot over high heat even if you have cured it. I’ve made beans before and will definitely try it the way you have in the recipe. However, how in the world does one get past the gas factor? The household seems to be gassy after a nice bowl of beans and I’ve gotten many tips; use garlic, use olive oil, use baking soda. I’m overwhelmed. Any suggestions? Absolutely love that I discovered you on my local PBS station. I look forward to your show every weekend. Oh well, there are many tricks people use. Some cooks like to soak the beans. Some cooks like to bring the beans to a boil and then drain that water and refill again. I just like to cook them until they are almost coming apart from being so soft… it works! I have been making beans for some time now and they have never tasted as good as these. I followed your recipe exact using Peruvian beans and WOW! Estan deliciosos! Perfect amount of broth, beans nice and soft and the salt is just right. Thank you. These will go great with chilaquiles tomorrow morning. Me da mucho gusto Annette! So true, a Mexican home always has beans. I have a fresh pot I just made. I love caldo de frijoles sprinckled with fresh cheese. So easy and delicious! Hi Patti, am going to try this recipe today, thanks for the sharing. I am trying to find a Mexican bean recipe that a local Mexican restaurant uses. Is it considered bad taste to require of the recipe? It is so very good. What do you think of using lard in a recipe and also bay leaves? I have not done so, but am wondering. Thanks for the tip about the salt. It is not bad taste at all, on the contrary! I always find it super flattering when someone asks me for a recipe, it will probably make them fill proud. Lard and bay leaves sounds fabulous: go for it. My parents are from Mexico so I grew up on rice & beans. My mother (and I think every mexican woman that I’ve asked) always ‘cleans’ the beans by sorting out the ‘ugly’ ones. Picking out blackened, shriveled, and other odd looking beans makes a huge difference to the flavor. Sometimes I’ve found little rocks and very strange beans amongst, yes, even store bought, bagged beans. A NECESSARY STEP for the perfect Frijoles a la Olla! Yes, a very important step!! Thank you, Jessica! I bought a small olla. 20oz. I’ve been trying to find a good black bean recipe for this size olla, but I can’t seem to find one. Do you have any tips on how much water, garlic, onions, etc. I should use when cooking black beans in an olla this small? And how long I should cook them for? Beans are it, this I know. I like to make my beans with an overnight light soak, then epazote, beer and tiny bit of onion and garlic, to give them a slight savory layer. I love your recipes and this site! Hi Pati! I’m just about to try my hand at making the beans. I have fond memories of when I was growing up we would go visit my Nana and she ALWAYS had beans on the stove. I think she would add a dried chile in the pot if I remember right. I thought about trying this but would you recommend putting one in in the beginning or at the end or does it matter? Thanks in advance. I put a dried chili in my beans when cooking them, also in chicken soup, turkey soup and stews. Take the chili out before serving. It adds a very subtle touch and a hint of spice and heat. Most people can not tell what the flavor is, but love it. Hi Bekka, Thank you for sharing!! I’m so glad I found your site! It’s wonderful! I’m a Filipina married to a wonderful Hispanic man, so learning to cook authentic Mexican food is a must! lol I grew up eating Mexican food because my best friend is half…so I got to enjoy the wonderful flavors it has to offer! I noticed that every household makes different rice and different beans. Though the ingredients are similar, the taste is slightly different. My husband’s grandma makes a different tasting rice and beans than my friend’s mom & grandma. I just thought that was interesting. I favor my friend’s mom’s rice & beans just because I grew up on it, but of course, I had to learn how to make my husband’s grandma’s rice and beans. For some reason though, I just can’t seem to make my beans look like his grandmother’s. She doesn’t put onions in her beans—just a clove of garlic and some bacon or fat of some sort. Have you tried it this way? The beans come out good. They just don’t seem to taste the same, and I can’t figure out why. :\ Anyway, this is just me trying to make sense of everything. Like I said, I’m glad I came across your food blog! I love it! Hi Char! I agree, there are as many ways of cooking beans are there are cooks! I always make mine with onion, though I would tell you to just choose what you like the best and/or to make what your hubby likes to keep him happy. Thanks for visiting! Ya te lo dije, pero te lo digo de nuevo… Esta receta y este post me hacen tener mucha nostalgia de la patria.. Â¡Qué antojo de unos frijoles de olla en casa de mi abuelo!